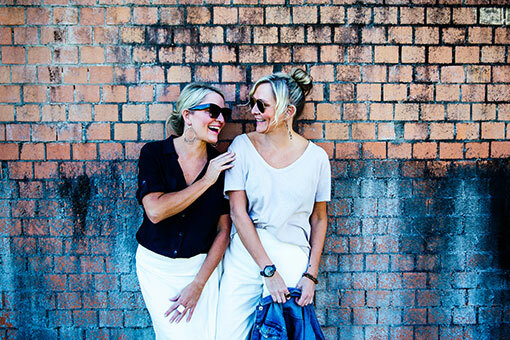 We’ve got our wardrobes pretty much down pat these days (well we do get enough time at the shops! ), but each Season we like to add just a few simple pieces to spice it up. After layering it up in the colder winter months, Spring is such lovely season to be going into. Fresh trends and colours start creeping onto the shelves early Spring and this season is no exception with some amazing bold colour and pattern combinations (love love the bright red and hot pink combo) and new styles around. One of the biggest trends this season is the cropped trouser/culottes This is such a great style to slip into, especially after wearing heavy jeans and pants for what seems like an eternity this winter! There are some amazing ones around and we especially love these navy pleated tie fronted culottes from Ally Fashions. Wear them casually with a t shirt and slides or dress them up with a simple silk camisole and heels. 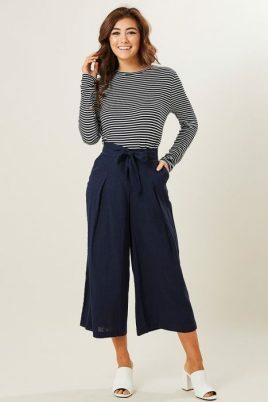 Ally Fashions Pleated Tie Front Culottes in navy $20.79 (on sale). This is another big trend that shows no sign of letting up. 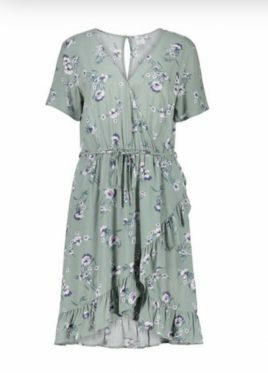 Nothing quite says Spring like a light and breezy floral wrap dress. This Kmart dress ticks all the boxes, its soft silhouette is so flattering on most body shapes and would look great worn casually with white sneakers and a denim jacket or with heels for a lunch date. A must have for Spring. Kmart Short Sleeve Wrap Dress $20.00. OK, this trend has been around a while now but it’s still going strong. We are huge fans especially when sneakers can be paired with anything from a skirt to pants and everything in between. If you haven’t got onboard yet, we urge you to give sneakers a go. Trust us, these sneakers from Famous Footwear will become your footwear of choice in no time. 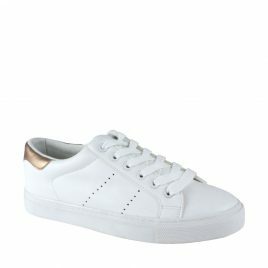 Famous Footwear Naughty Monkey Cruisey sneaker in white/rose gold $39.99. Slides are a great update for your summer sandal. Not only are they super comfortable, they look great with summer dresses as well as this season’s cropped pants and cullottes. What’s not to love? 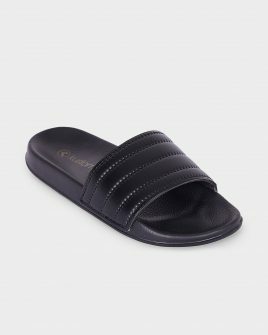 We love these Black Maya Slide from Surf Dive and Ski. Surf Dive & Ski Maya Slides in black from $25.95. Fashion designers have been going dotty for spots lately, with this pattern appearing all over the Spring/Summer runways. This cute linen shirt from Rodney Clark is a lovely example of the trend, fun and classic at the same time. We’ll have you seeing spots in no time! Rodney Clark Dot Linen Shirt $129.95. One of the easiest ways of dipping a toe into a trend without diving on in, is to add a beautiful bag in the season’s hottest colour. It looks especially amazing when coordinated with red. This fuischia pink Guess bag by Strandbags would be a great addition to any wardrobe, adding a bold pop of colour to any outfit. 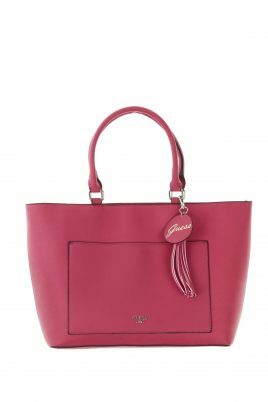 Strandbags Guess Nido Tote Bag in Fuschia $149.25 (on sale).